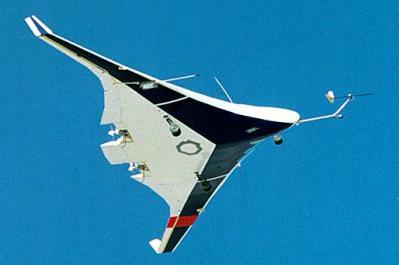 During the early to mid 1990s, McDonnell Douglas (and later Boeing, which acquired McDD) studied airliner designs of blended wing/body (BWB) configuration, which is essentially a flying wing with a wide lifting-body shaped center fuselage. In cooperation with NASA and other research organizations, a small propeller-driven BWB model airplane of 5.2 m (17 ft) wingspan was built, and test-flown in 1997. As a continuation of the project, Boeing and NASA developed a design for a BWB transport aircraft powered by three large turbofan engines. Such an aircraft could be a very efficient airliner and cargo transport with high capacity and long range. 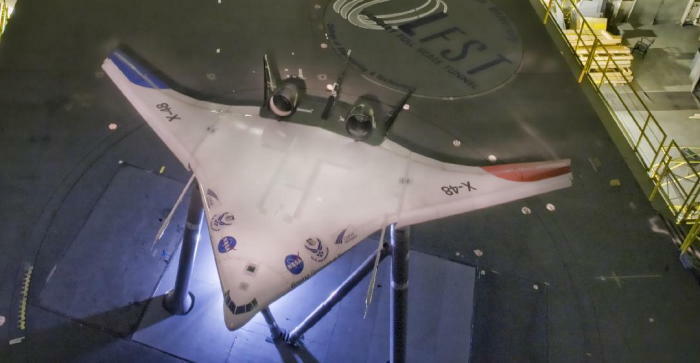 In early 2000, Boeing began the construction of the BWB-LSV (Blended Wing Body - Low Speed Vehicle), an unmanned 14% scale vehicle of the BWB transport, to evaluate the design in actual flight tests. In late 2001, the official designation X-48A was allocated to the BWB-LSV. The X-48A was made primarily of composites, had a wing span of 10.7 m (35 ft) and was powered by three small Williams J24-8 turbojets. As of mid-2001, the plans called for a completion of the vehicle by the end of 2002, ground tests through 2003, and a first flight in 2004. However, problems in the development of the flight control system as well as changing priorities at NASA led to the termination of the X-48A program (probably in early 2002). 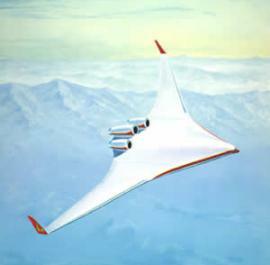 The cancellation of the X-48A was not the end of the NASA/Boeing BWB research. The project continued at a much reduced level, and in 2002 Boeing contracted Cranfield Aerospace (UK) to design and build a smaller (8.5% scale, with about 6.4 m (21 ft) wingspan) BWB model. This vehicle was eventually designated as X-48B in June 2005. In November that year, Boeing announced that two examples were built and are planned to be flown in 2006. NASA has already flown a smaller (3.7 m (12 ft) span) model of the X-48B in a wind tunnel. The U.S. Air Force is now also involved in the BWB program, since the AFRL (Air Force Research Laboratory) is listed as a participator in the X-48B development. Extensive ground tests with the two X-48B vehicles at NASA's Dryden Flight Research Center began in late 2006. These tests validated engine and fuel system, battery endurance, the telemetry link, the flight-control software, and the aircraft's taxiing characteristics. The first flight of the X-48B eventually occurred on 20 July 2007. The vehicle is controlled by a pilot on the ground, who sees video transmitted by a forward-looking camera in the aircraft. After the initial low-speed flights, higher-speed tests were performed in test phase II. The latter required some modifications to the X-48B to increase its maximum speed. Phase II flight tests eventually began in spring 2008. By April 2009, 50 X-48B flights had been completed successfully, and a follow-on test program is planned to explore the limits of the vehicle's flight envelope. The X-48C is similar to the X-48B, but includes modifications to reduce the noise level. This includes reducing the number of engines to two, and adding two vertical fins to shield engine noise.